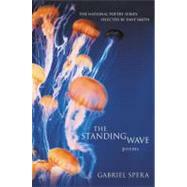 An exciting first collection of poetry from an emerging talent, Gabriel Spera's The Standing Wave was a winner of the 2002 National Poetry Series Open Competition, selected by esteemed poet Dave Smith. For over twenty years, the National Poetry Series has discovered many new and emerging voices and has been instrumental in launching the careers of poets and writers such as Billy Collins, Mark Doty, Denis Johnson, Cole Swensen, Thylias Moss, Mark Levine, and Dionisio Martinez. like a hammerer's ripe thumb. that track the ink indoors. to receive the day's take. of their hidden gold of oil. in a mound of plain sea salt. waking of their pearl-black flesh.